VINTAGE COSTUME ANTIQUE ESTATE JEWELRY BROOCHES AND PINS! Celluloid Red Rose Bouquette Antique Goldtone Vintage Antique Estate Brooch Pin / Pendant For Weddings, Proms, Pageants And Parties! 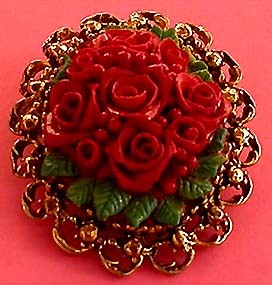 Item #P168186 - Celluloid Red Rose Bouquette Antique Goldtone Vintage Antique Estate Brooch Pin / Pendant. Flaw: The top half of the green leaves have broken off. Not noticeable unless you look very close. Size: 2 1/4 x 1 3/4". The gorgeous red of the vivid celluloid rose bouquette contrasts strikingly against the rich green leaves. The beautiful bouquette is then embellished by the surrounding antique goldtone high polish raised beads with the somewhat Nouveau style circles accompanying them. I can envision it adorning the high collared long dress of an elegant lady from the early 1900's. There is also a loop on the back of the brooch where you can put a chain through to wear as a pendant. The size of the bouquette is 1 3/4" x 1 1/4". The side profile of the brooch is 1/2" tall. So much beauty, charm, grace and versatility! Excellent Condition. A fabulous brooch pin to wear at weddings, prom nights, pageants, parties, cruises and special functions! Price US$128.00.